So, finally, the fruits of my extra labor are seen in print. Seeing as how I've had several folks I know get married recently and/or announced their engagement or wedding plans, I thought I would offer this up. I worked on The Alabama Marriage Handbook as a freelance job and quite enjoyed the job. 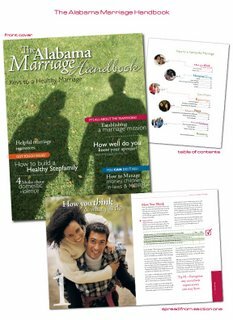 The handbook is a 44 page guide for newly wed couples in Alabama and will actually be handed out with a marriage license in the state. I'm pretty excited about seeing these printed! On the 19th, the first lady & governor of Alabama present this book and will renew their own wedding vows. If you would like to see all 44 pages and do all of the "excercises" in the book, you can download the PDF from the Alabama Cooperative Extension System Web site: Click here to download the PDF. For those of you who are satisfied with a little peak, there is an image below and, as always, you can click on it to see it larger. This is so cool. I'm going to check out the whole package. wierd! It took me to a microsoft website?! Straaange. I'll hafta look into that one. That did work Mary. I'll read it this weekend. This looks great! I had a chance to scan over it, and I even mentally took a few of the little quizzes in the book.